Soak skewers completely in water at least 30 minutes. Combine mustard, orange marmalade and TABASCO® Sauce in small bowl. Set aside. Divide scallions into individual strips. Blanch strips in boiling water for 30 seconds. Drain skewers. Thread 2 shrimp and 1 sausage slice onto each skewer, twisting a scallion strip around each skewer. 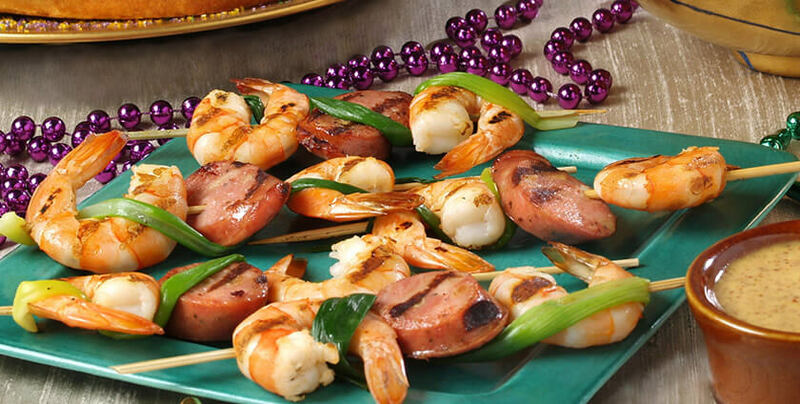 Repeat with remaining skewers, shrimp, sausage and scallions. Brush shrimp with TABASCO® Sauce. Place skewers on grill. Grill 5 to 8 minutes, turning once until shrimp are cooked through.